In the fall of 2014, my wife, Sonia, and I set out on a 200-mile trekking trip to Nepal to experience the famous Annapurna Circuit along with a few side trips. As we were starting the trek, along with a local guide we’d hired, a line of thunderstorms in the Indian Ocean spawned a Category 4 cyclone, which caught Nepal by surprise. We were about halfway around the circuit in a communications black hole, getting ready to cross an 18,000-foot pass when balmy weather turned into a snowstorm. Many were trapped up high without the proper equipment. Some had never seen snow before. While we were safe in a village at 12,000 feet, the storm unleashed avalanches everywhere. An estimated 43 people died from slides and exposure. The story made international news at the time. 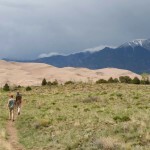 To escape, we backtracked over swollen rivers and mudslides. It was a sad march as we mourned those who didn’t make it out. Don’t get me wrong. While we experienced shadow, we also saw an abundance of light. It was a magnificent trip and I miss Nepal and its wonderful people every day. I can’t stop thinking about returning to snow leopard country. HELICOPTER RESCUE: We researched many travel insurance companies but couldn’t find one that we were comfortable with. Many customers had horror stories about some companies not paying out on claims. We joined the American Alpine Club, which offers a $5,000 helicopter rescue benefit (international or domestic) through Global Rescue. When our family couldn’t contact us, we were temporarily put on a list of missing people. Global Rescue acted quickly and professionally and was able to confirm through our guide service that we were OK. Although the helicopter didn’t have to go after us, we were impressed with Global Rescue’s response. SICKNESS: Although the avalanches and landslides didn’t get us, the bacteria did. After we both came down with severe intestinal infections, we went to the Celestial Health Care Center in Pokhara. The pills (Cipro) we’d brought with us weren’t strong enough. A great doctor fixed us up with more powerful antibiotics and probiotics manufactured in India. It did the trick. The health center charged us only $60 each for the examination, medication and free follow-up visits. The money charged to foreigners then goes to provide free health care to Nepalis. The doctor mentioned five things westerners should not eat in Nepal if they want to avoid getting sick. It’s a little tough because the food is so good. 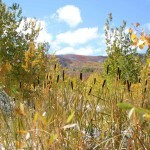 GEAR: Because we live in Colorado, we were able to test the gear throughly before we left. 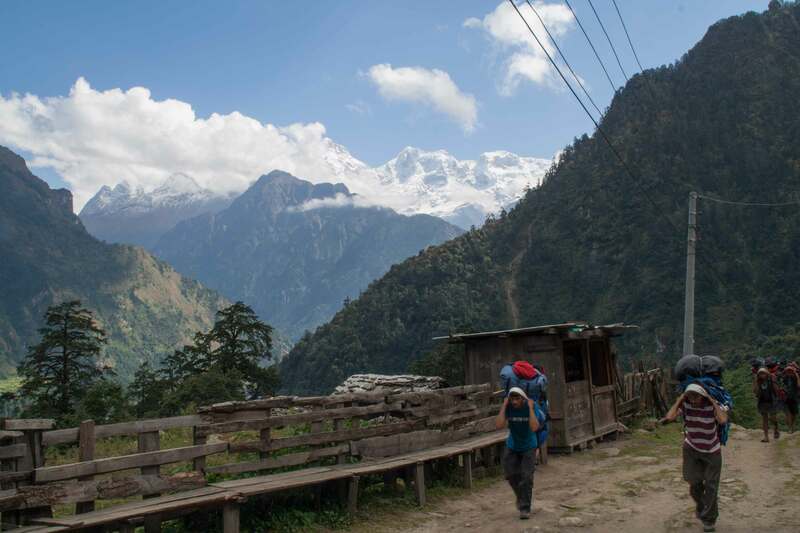 But on the Annapurna Circuit, as with other treks in Nepal, you encounter a variety of conditions from the sweltering lowlands to the upper alpine landscapes. I won’t repeat what’s on many other gear lists, but I want to highlight a handful of items. Cocoon MummyLiner (silk): Provides a luxury sheet for your sleeping bag or can be used alone in hot climates. Easy to wash and dries out fast. Doesn’t weigh anything. Blankets and sheets at teahouses are notoriously dirty. SmartWool Hike Crew Socks: These worked great, especially when paired with SmartWool liner socks. No blisters. They do take awhile to dry out after you wash them. The liner socks dry much faster and give you the feeling of having fresh socks. Outdoor Research Sun Runner Cap: I’ve yet to get sunburn on my face or neck when I wear this hat properly. Lightweight and packs down to nothing. prAna Stretch Zion Pant: Best hiking pants I’ve ever owned. Amazingly comfortable and durable. Dry fast. Roll them up in hot climates to avoid the chimney effect caused by warmth from your boots. SteriPEN Classic 3 with Pre-Filter: This worked without fail to purify water on the fly. I didn’t have to carry as much water. The pre-filter came in handy as there was sediment at some water taps. I used chlorine tablets for backup. 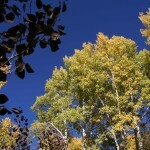 Survive Outdoors Longer Emergency Bivvy: I left this item out at the last minute, but I won’t make that mistake again. We were nearly in a survival situation and it could have helped me or someone else. BONUS TIP: Tuck lithium batteries in your sleeping bag at night to keep them warm and minimize depletion. Who says adventure has to be expensive? 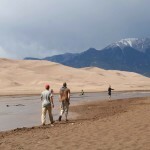 I recently went, along with two friends, to southern Colorado to try out sandboarding at Great Sand Dunes National Park. 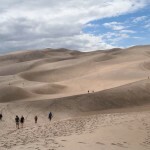 It’s one of those otherworldly places that seems like it belongs more in southern Utah with its combination of mountains, dunes and rivers. In any case, it was great fun trying to stay upright. Waxing the board frequently is the key to sliding vs. stopping. But the sand is certainly determined to find places to hide. It worked its way into the stitching of my backpack and just about everywhere else. 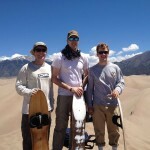 While sandboarding really doesn’t compare to the winter version, it’s a fun way to descend miles of sand. Photo copyright Nathan A. Ferguson. Two companies are poised to shake up the snow sports industry with radical new airbag backpack systems. They’re designed to provide the latest in defense against gnashing avalanches, and solve problems with an earlier generation of systems. But experts do have concerns. 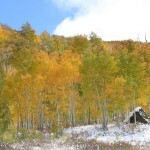 In a blog post, director of the Utah Avalanche Center, challenges claims made by some advertisers. Although he’s supportive of new winter tech, he points out that if skiers and snowboarders rely on it too much, they may find themselves in increasingly dangerous terrain and situations where airbags won’t help. Market demand, meanwhile, seems strong. At least a dozen brands are now offering the products. Here’s a rundown on the evolution of airbag packs. While there are three main kinds of avalanches, the most dangerous slides, often triggered by humans, occur at weak layers in the snowpack. It fractures and releases large slabs that dredge up compacted layers of snow and ice. Avalanches exhibit almost fluid-like behavior as they move down the mountain, settling into heavy masses as they come to rest. If a victim gets buried completely, rescuers may have to remove a ton or more of snow to reach them — not to mention deal with severe injuries once they do. Avoiding an avalanche altogether is the best course of action through proper training, planning and weather knowledge. Avalanche survival has traditionally focused on passive safety. The core pieces of equipment are the shovel, the probe and the transceiver. In other words, you have to wait for your buddies to find you and dig you out. Black Diamond helped push the passive winter tech envelope with its AvaLung, a breathing device that prolongs how long a victim can remain under the snow. It pulls in oxygen through a filtration system while moving dangerous carbon dioxide away from the face. The AvaLung can be strapped to the body, and it also comes as a built-in feature on certain backpacks. Though it’s simple and lightweight, the trick is getting the mouthpiece clenched in your teeth before it’s too late. A German company, ABS Peter Aschauer, started the airbag backpack movement in 1980s with the launch of systems powered by compressed gas cartridges. 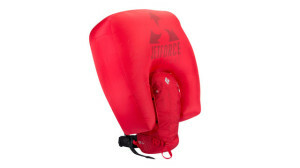 Airbag packs were designed to augment the traditional tool bag and help skiers, snowshoers and snowmobilers stay afloat. Once inflated, airbags also protect the head and upper body. They became popular in Europe. Pro snowboarder Meesh Hytner fell pray to a nasty slab avalanche in Colorado in 2012. She deployed her Backcountry Access Float 30. “I felt like I was riding a mattress down the stairs. This thing saved my life,” she’s quoted on BCA’s website. Arc’teryx caused a small stir in 2012 when it filed for a U.S. patent for a fan-filled airbag powered by a battery instead of an air cylinder. Then Black Diamond started teasing the market with its newfangled airbag system that sounds less like an explosion and more like a vacuum cleaner. Lou Dawson of Wild Snow had his hands on a prototype version and provided the first detailed report on Black Diamond’s “JetForce” technology. The pack uses a ducted fan to inflate the bag in 3 seconds. An electronic brain then initiates a series of cycles based on a typical avalanche scenario. The fan keeps sending air to the bag in case of tears. After 3 minutes, the bag deflates to provide an air pocket if the victim ends up buried. Dawson points out some advantages to the system: no hassles with traveling on the airlines or having to find places to refill air cylinders, multiple inflations without having to carry heavy spare cylinders, lesser chance of accidental inflation and easy repacking. And there are some disadvantages such as relying on lithium batteries, possible obstruction to ambient air intakes and limited pack styles. Black Diamond’s system won’t be cheap and is expected to be in the $1,000 range, comparable to some of the more expensive compressed-gas systems. Weight for its smaller Halo 28 pack will be around seven pounds. A Black Diamond spokesman says the company doesn’t have a set product release date. Ultimately, Tremper advises backcountry adventurers to choose slopes carefully. “In terrain with few obstacles, terrain traps, sharp transitions and smaller paths, avalanche airbags have the potential to save significantly more than half of those who would have otherwise died,” he writes. 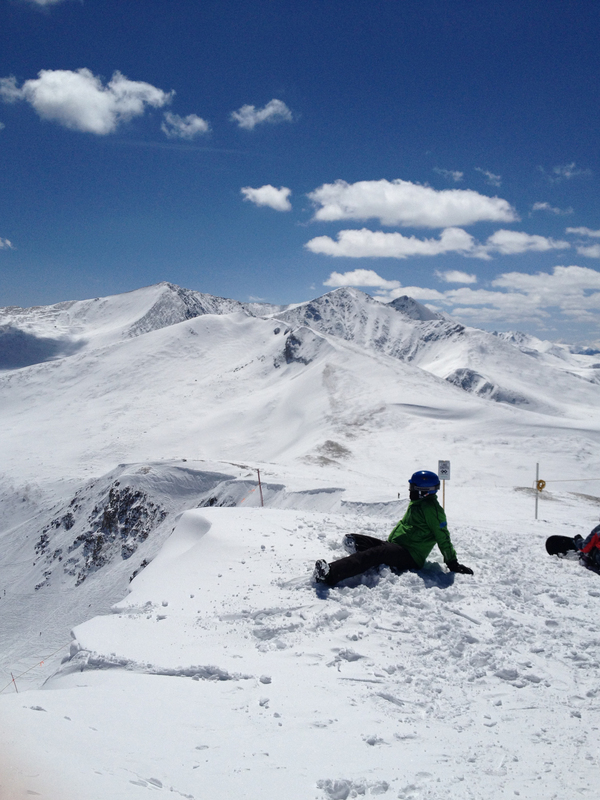 Hiking to more than 13,000 feet at the top of Breckenridge Ski Resort. Photo copyright Nathan A. Ferguson. Skiing began as a simple and effective form of locomotion across snow-covered landscapes. It would take thousands of years for it to morph into a multibillion-dollar industry. To understand modern equipment, it’s important to take a look back to see how the snow ski evolved into a fine carving instrument. Early attempts date back more than 5,000 years in Russia and Scandinavia, according to archaeological research. The skis were wooden and used for hunting, trapping and crossing frozen waterways. Things didn’t change dramatically until 1850, when Norwegian skier Sondre Norheim, widely considered the father of modern skiing, incorporated camber — or a middle upward curve — into his skis. By allowing the skis to bow slightly upward underfoot, more of the skier’s weight could be distributed to the tips and tails, which made turning easier and improved grip. This became the design standard well into the next century. Norheim didn’t stop there. Nearly 20 years later, he demonstrated the telemark turn on skis made out of single pieces of hardwood with sidecuts that made them narrower underfoot. In addition to camber, sidecut improved turning by allowing the skis to flex. Norheim used bindings that allowed his heels to rise while his toes remained fixed, allowing the skier to lunge and maneuver through fluid turns. Even today, this technique is difficult to master. The next century saw tremendous progress in ski design and the making of sporting-world luminaries. 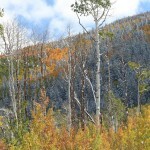 One of them was Abel Rossignol, a carpenter and diehard skier who in 1907 made his first set of skis out of hardwood. His company would go on to experiment with all-metal and fiberglass skis, as well as vibration damping. By the 1970s, Rossignol would become the largest ski manufacturer in the world. But ski design had two big problems, both related to turning on hard snow. Throughout the 1920s, Austrian Rudolph Lettner experimented with segmented steel edges that flexed with the ski. They dug into ice and improved durability. While this was a huge improvement, there was a drawback: The edges had to be screwed onto the skis and often came off after hard use. In 1950, aeronautical engineer Howard Head set out to make skis lighter and easier to turn. He founded the Head Ski Company, and his innovations with laminated skis helped grow the skiing industry. The 1960s saw huge advances that carried on into the 80s. Plastic boots, better bindings, and skis made of increasingly complex composite structures gave way to a new technique, the elegant parallel turn. The ski industry went into a tizzy when Elan introduced a radical new ski design in 1993. Its SCX, or SideCut eXtreme, featured a sidecut three times deeper than previous skis, which gave it an hourglass shape. This made it easier and more efficient to carve turns. After proving the design on race courses, other companies started producing “parabolic” or “shaped” skis. By the end of the decade, straight skis had pretty much become endangered species. Ski design continued to get funkier. In 1998, Salomon produced the 1080 with raised tails, initially designed for allowing skiers to do snowboard-like tricks by skiing backward and negotiating reverse takeoffs and landings at terrain parks. Twin-tip skis later proved to provide better float in deep snow. After a century of trial and error, ski designers had perfected skiing on groomed terrain at resorts, but the industry was diversifying, and extreme skiers were eyeing virgin peaks. In 2002, Volant introduced a powder ski called the Spatula, a concept originally dreamed up by pro skier Shane McConkey. Years earlier, he’d sketched it on a beer napkin. It featured reverse camber (now known as rocker), wherein the waist of the ski sat flat or lower than the tips and tails, allowing it to float. Reverse sidecut made the ski turn more easily without grabbing in deep, soft snow. This created a new genre of twin-tip, super-fat skis. Some, like the modern Fat-ypus A-Lotta, are 6.8 inches wide at the tips. Technology continues to drive the industry, yet, as with the ancient hunters, more people are burning calories in the backcountry. Alpine touring bindings unhinge at the heels so that skiers can walk uphill with climbing skins attached underneath skis. For the trip down, the heels are locked and skiers make traditional alpine turns. This is much easier than learning the old-fashioned telemark technique. But they should give a nod to Norheim for showing them the way 150 years ago. With an explosion of ultralight outdoor gear on the market and a cultural shift toward endurance events, backpackers are hiking farther and faster. But some of the lightest and most useful gadgets can be assembled in minutes with household materials. Andrew Skurka is one of the most experienced long-distance backpackers in the world and a discerning critic when it comes to gear. After making hikes of up to nearly 7,800 miles, he knows what works and what doesn’t. So what does a professional rely on to cook his evening meals while in the field? 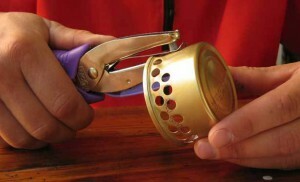 An alcohol-burning stove made from a cat food can. Skurka started using the “Fancy Feast” stove, made from a 3-ounce aluminum can, after it was presented to him by a visitor at one of his backpacking clinics in 2006. Skurka demonstrated it recently at a presentation in Golden, Colo., and says it works great for one to two people. Simply put, it’s a matter of removing the lid and food, cleaning the can, and strategically punching vent holes in the side. Then you pour in a tiny bit of denatured alcohol (depending on desired cooking time) and light it up, provided you’re in a well-ventilated area. A cooking pot then goes on top of the can. The stove has its own underground following with backpackers bent on improving it. While many other shapes have been tried, the cat can, in particular, provides excellent heat flow and conductivity. Jim Wood has produced some of the most detailed information on the concept. Wood gets somewhat scientific about the placement and number of vent holes and provides the precise measurements on his website. The vent holes are critical for determining if the stove works properly and how quickly it heats food. Wood has created what he calls the “Super Cat,” capable of boiling water rapidly, and another version, “Simmering Cat,” for slower cooking. On his site, Wood goes over the dangers such as carbon monoxide poisoning and unintentional fires. He also provides tips on making accessories such as wind screens, snuffer caps and boiling pots from other common materials. Besides low weight and foolproof simplicity, fuel availability is one of the biggest reasons the cat can stoves have become so popular. Denatured alcohol, the fuel of choice because Wood says it burns hot and clean, can be obtained at hardware, automotive and liquor stores. Some people have even assembled the stoves while on the trail. Here are some other ideas gathered from weight-obsessed backpackers to help you keep things light and simple. Staying dry: Skurka inserts a trash compactor bag inside his pack. The unique dimensions fit nicely and keep his bedding and extra clothing dry in surprise rainstorms or during stream crossings. Food seasoning: Take multicolored drinking straws and fill them with your favorite herbs and spices. Use a different color for each seasoning and cut the length of the straws for the desired servings. Burn the ends of the straws to seal them. Fire starting: Make survival fire-starting materials with cotton balls and petroleum jelly. On his blog, Leon Pantenburg describes how to do this along with using a sparking device. Lighter feet: While it’s nice to relieve your back of excess weight, it’s important not to forget the feet when backpacking. There have been numerous studies about how wearing lighter footwear can save a disproportionate amount of energy compared with lightening the pack. Skurka wears trail running shoes with ankle-high gators to keep out debris. For extra stability, he uses lightweight trekking poles. The extremes. That’s what Colorado is famous for: altitude, weather and, well, people. 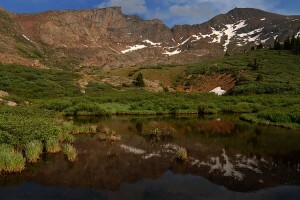 When I first moved to the state nearly five years ago, I decided to climb 14,000-foot Mount Bierstadt during my first few days in town. While it’s among the easier of the 14,000-foot mountains in the state, my body had been down at sea level for far too long and I could feel it. As Copper, my lone dog at the time, and I were halfway up, we saw something strange. Not a yeti but a young guy running down the mountain with a card table strapped to his back. As we were about three quarters of the way up, another guy was heading down, but not at such an alarming clip. Instead of a table, he had mini-keg on his back. He was followed by another guy holding a tin of biscuits and he offered me one. I had to ask what they were up to. “Oh, we were just having lunch on the summit,” he said. I laughed. I’d moved to the right place. A Swiss company has developed a highly versatile hang glider but with a more rigid body like a sailplane. The company says it can climb rapidly and turn tightly to exploit tiny sources of lift. The glider is aptly named the Archaeopteryx after a genus of early bird that acted as a bridge between modern birds and feathered dinosaurs. The glider can launch in many configurations: on foot by running off a decent slope, by winch, towed behind a car or light powered aircraft, or by being fired like a slingshot with a bungee. The pilot has the choice of landing on a single wheel aft of the cockpit or by dropping her legs through trap doors and using her feet in a more birdlike fashion. Removable fairings around the cockpit area turn the Archaeopteryx into a convertible for those hot days. The glider is de-rigged like a sailplane and rides on a trailer. While it’s not as compact as a paraglider that can be carried in a backpack, it weighs far less than a sailplane. 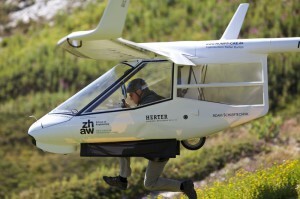 Videos on the company’s website provide stunning footage of soaring in the Alps. 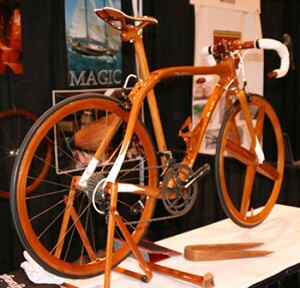 Aluminum may be the most abundant metal in the Earth’s crust, but it was scarce at the 2013 North American Handmade Bicycle Show. While plenty of mass producers are still building with it, artisans at the show were pushing the edge with new techniques. This was materials science gone mad, but in a good way. And this year’s show in Denver broke an attendance record with some 200 exhibitors and an estimated 7,000 attendees even though the third and final day saw the city’s biggest snow dump of the season. While the artisans shared a passion for cycling, they drew on their personal experience. Take Chris Connor of Connor Wood Bicycles who was showing off his Woody Scorcher made of steam-bent ash wood and reinforced with layers of Kevlar. It gave it a distinctly baseball bat feel. Connor transferred his knowledge of carpentry and building guitars into his two-bike line. The Scorcher comes stock with 29er wheels, disc brakes, and a Gates Carbon Drive System in single-speed configuration for $4,500. Then there was Sueshiro Sano of Japan showing off his striking mahogany, yes mahogany, road bike. His family has been building wooden boats for more than 200 years and he got into the business when he was 13. There were more than a few vibration-absorbing bamboo bikes, some mated with carbon tubing. And there was a just-for-fun bike made of Douglas-fir. The competition was friendly but intense with some builders putting in special requests to large component manufacturers to give them the edge in winning show prizes. Can you make that part in purple? And of course they did. All the niches were well represented with a lot of attention going to fat tire mountain bikes, belt drives, internally geared hubs and gravel racing/multi-surface touring bikes. It will be interesting to see what happens with titanium versus newfangled stainless steel. There seems to be a growing number of formal training courses in frame building and with software like BikeCAD Pro, it’s not too difficult to develop your own dream ride. In any case, this is good energy for all aspects of cycling. Let the creativity roll. This is more about psychology than skiing. When I was 17 I bought a pair of the same skis that the U.S. Ski Team was using. The Rossignol 4S Kevlar was an iconic model in its day. With the skinny waist, lightweight materials, vibration damping and catchy teal color, they pushed the edge of what straight skis could do. They were designed for steep slalom courses. In other words, they were perfect for the East Coast and its infamous bulletproof ice. I remember how beautiful they looked unmounted at the ski shop. I pulled out a happy-looking pair in the 200 cm length. On my first run somewhere in the Poconos, I let my weight get too far back and they crossed at the front bindings. It catapulted me into the woods. The 4SK’s commanded respect. Little did I know at the time that my brain wasn’t fully developed. As a male, I had another eight years for that to happen, according to psychological research. My friends and I were impulsive and always doing stupid things. It was all about speed and attempting mostly disastrous jumps. This was before helmets and terrain parks. How’d we survive? We also had limitless energy from some secret source. As if we had miniature nuclear reactors within us, we’d rise at dawn, drive up to two hours, catch the first chair lift and ski until the last one. For some reason, we always changed clothes and made the last run in shorts despite the weather. Then we’d drive home and go out later. Those were the days. It couldn’t get any better than that. 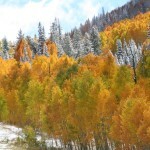 In the spring of that same year, I was lucky enough to ski out West for the first time. I pointed the Rossies downward at Vail’s massive China Bowl and they quickly submarined into the sticky crud. Once again, I got catapulted. As a Colorado resident now, ski design has gone through a transformation where western skis are getting fat and fatter to maximize float in powder. I’ve also taken up backcountry skiing where you have to provide your own propulsion upward. The Liberty Double Helix skis, designed here in Colorado, are my vehicles of choice. They can handle anything. There’s a reason I’ve hung onto those old skis and it’s not for the ’80s parties at the local resorts. Every scratch and ding tells a story.